You are here: Home / Giveaways / A Charlie Brown Christmas by Vince Guaraldi is a Holiday Must-Buy! 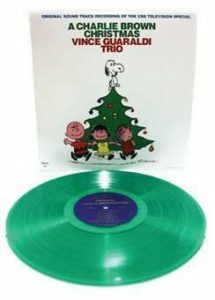 A Charlie Brown Christmas by Vince Guaraldi Trio is one of the most popular and beloved holiday albums of all-time. This remastered recording on green vinyl includes 3 bonus tracks not on the original 1965 LP plus a 20-page booklet filled with images from the program and liner notes by Vince Guaraldi historian Derrick Bang. Find the LP on Amazon – http://a.co/d/fmqmPTP and the Charlie Brown LP can also be found at just about every store that sells vinyl! We have teamed up for a fabulous Giveaway! One winner will win the Charlie Brown LP! Leave a comment below telling us your favorite song from the list above! Deadline to enter is December 16th, 2018 at noon PST. One winner will randomly be selected. U.S. Residents only. You can enter once a day! Self Disclosure: No compensation was received to post. Image and information were provided by Concord Music. SoCal City Kids will randomly select the winner and the prize will be sent out by Concord Music. Christmas Time is here. The instrumental version.